There have been many films with characters who battle dis associative identity disorders ( schizophrenia, multiple personalities) from All About Eve to Sybil to A Beautiful Mind. 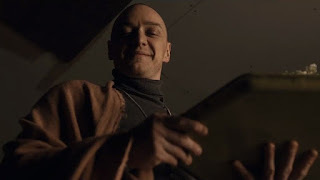 DID's affect perhaps just 1% of the population but the 6 character(s) portrayed by a singular James McAvoy are wonders to behold in their diversity and expression. We meet six of the 23 who reside in his one body. Going in knowing as little as possible about the storyline and characters as possible is the way to go here. McAvoy's onion peeling performance is by far the star attraction here. He plays Kevin Wendell Crumb, who is being seen in therapy by Dr. Karen Fletcher ( Betty Buckley), who has long documented the various personalities over the years and views Kevin as someone who can demonstrate real altered states of a physiological nature within Kevin and she suspects something foul is afoot where Kevin lives. Turns out he has kidnapped three young women following a birthday party, and is keeping them prisoner. One by one, each of several characters within him make themselves known to the girls and an ominous warning is made about the "one to come" who has an evil, destructive purpose. Anya Taylor-Joy (The Witch) plays Casey Cook, the more cerebral of the three girls, is a social outsider. The other two girls want to use brawn over beauty and brains to escape but they are simply annoying and cumbersome baggage to Casey. They have led perfect and privileged lives and Kevin has taken notice. Casey, it seems, has a backstory, told in flashback, in that her father, who taught her to hunt, has died. She is being raised by an uncle. Casey, it turns out, is not a stranger to trauma and its after effects. As a result, she chooses to use mind over brawn in attempts to outwit Kevin and attempt to secure their freedom. The setting, somewhere underground with pipes and rooms and storage is suffocating, stifling and claustrophobic, a house of potential horrors where the personalities reside in shared spaces. The pace is controlled and deliberate. There is the requisite MKS cameo and moments of playful interaction as the horror of what Kevin will become and why is revealed in bits and pieces. Two characters are trying to take over wounded boy Kevin, and the others keep trying to warn the Doc and keep "the beast" at bay. This new guy should be visiting sometime soon and he doesn't really want to play very nice. Split is fascinating purely as a Psyc study. McAvoy only filmed one character per day and took the role when Joaquin Phoenix no longer could consider it. The film is fluid and riveting, confident in its unfolding and leaves some raised eyebrows in end. The script has so few holes as to not be annoying or distracting and it appears that M. Knight, writer and director, is back, which will please his most loyal fans.